Jimmy Choo Eau de Toilette by Jimmy Choo is a sweet fruity fragrance for women. A fresher and more exotic reinterpretation of Jimmy Choo EDP, this floral Eau de Toilette begins with vibrant ginger, pear and green accords and develops with a bouquet of tiger orchid and tea rose before drying down on a base of woods and cedar. What separates the Jimmy Choo Eau de Parfum from the Eau de Toilette? The EDT is a lighter and softer scent and does not contain patchouli like the original EDP. The fragrance is housed in the iconic glass bottle characterised by classic Jimmy Choo prints. 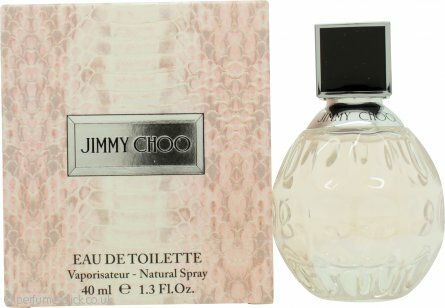 Jimmy Choo Eau de Toilette was launched in 2012.